Silver medal for Filip Ude, Čakovec, Croatia, in pommel horse at the 2008 Bejing Olympic Games. The second accompaning song is Međimurje kak si lepo zeleno (Međimurje, how beautiful you are). Međimurje is a northern part of Croatia known for specific, very beautiful songs. Filip Ude was born in the town of Čakovec. Filip Ude with his Russian trainer Igor Kriajimskij, celebrating the greatest success of Croatian gymnastics in history. Eleven years of hard work crowned with the Olympic medal for Croatia. Filip Ude dedicated his silver medal to his beloved mother. Filip was left without his father at the age of six, who died in an accident. His trainer Igor Kriajimskij is working with Filip for already 11 years, since the very beginning. Filip did his exercises with wounded shoulder, and he will woon go to the operation. In May 2008 a very modern gymnastics hall was finished in Nedelišće near the town of Čakovec, and only now will Croatian gymnasts have the opportunity to train under normal conditions. The gymnastics building has also other purposes. For example, in June 2008 a traditional yearly Festival of Međimurje Folk Songs was held in this building, 19th in order. 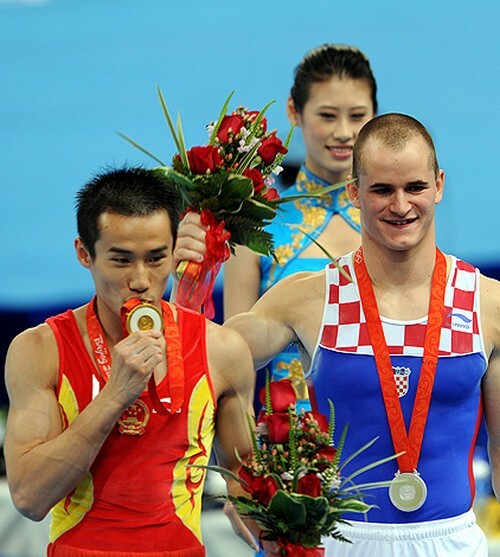 China's Qin Xiao won the gold, Croatia's Filip Ude the silver. Although Croatian gymnast Filip Ude earned the right to compete at this summer's Olympic Games in Beijing on the basis of his all-around performance at the 2007 World Championships, he is aiming for Olympic glory on just two events. Ude finished 22nd all-around at the 2007 Worlds in Stuttgart that served to qualify teams and individuals for Beijing. He will be one of two Croatian gymnasts in Beijing; Tina Erceg will represent the women. Prior to 2008, the only gymnast to represent independent Croatia in Olympic competition was Russian-born Alexei Demyanov, who tied for 56th all-around at the 1996 Atlanta Games. Ude enters the 2008 Olympics as a legitimate medal candidate on pommel horse, the event on which he won the silver medal at the European Championships, held May 7-11 in Lausanne. Born June 3, 1986, in Cakovec, Ude began training at age 8. He is coached by Mario Vukoja and Igor Kriajimski at the Marijan Zavradec Macan club. "Very often I consider them as my older brothers because we have been working together for 15 years now," Ude says of Vukoja and Kriajimski. Ude's international rise during the current Olympic cycle is impressive. His 22nd-place all-around finish at the 2007 Worlds represented a remarkable jump from his ranking at the 2006 Worlds, where he was 66th. In World Cup competitions, Ude's best performances include first place on floor exercise at Moscow and Maribor in 2006; third place on floor exercise at Ghent in 2006; and third place on parallel bars at Maribor in 2007. He also placed fourth on floor exercise at the 2006 World Cup Final in Sao Paulo. In this IG Online interview, Ude describes his Olympic agenda, and the way he is managing the high hopes his fellow Croatians have for him in Beijing. IG: Filip, congratulations on your silver medal in Lausanne. Your teammate, Robert Seligman, was third. What makes Croatian gymnasts so strong on pommel horse? FU: Thank you very much. To be honest, I'm also surprised that a country as small as Croatia has two top gymnasts competing on pommel horse. I think that everything is just matter of good training. IG: It is unusual for a gymnast to have floor exercise and pommel horse as his two best events. How have you managed to become strongest in these two very different pieces, but also become a consistent all-arounder? FU: Yes, I'm an all-around gymnast but I think that my best apparatuses are floor and pommel horse, because I always liked to jump and spin around, and these are two apparatuses I always liked to train on. That is the reason why they became my favorite and best apparatuses. IG: How are your preparations for Beijing going? FU: Well, just a few days ago we opened a new gymnastics center in Nedelisce, a place just a few kilometers away from Cakovec, my birthplace, so I can finally train at "home." Preparations are going so far, so good, and I believe that I will give my best to be prepared for the Olympics. IG: What are your expectations and dreams for Beijing, in the all-around and in the individual apparatus? FU: Because I have injured my right shoulder I will not compete all-around in Beijing. I will compete only in my two best apparatuses — floor and pommel horse. My wish is to get into finals in one of these apparatuses, and in finals, everything is possible. IG: What kind of support and encouragement are you receiving from the Croatian people and government? FU: Well, gymnastics isn't a very popular sport in Croatia. But, after all these good results, it is becoming much more popular, so that is why a lot more people know about us. Therefore, it is financially a lot easier for us than it was earlier. IG: How are you managing the expectations for you to perform well in Beijing? FU: Now so many people expect a medal at the Olympics, but I don't feel any burden because of that. I know that I have to give my best and the result will come. IG: Happy belated birthday (June 3). How many more years do you wish to compete in gymnastics? FU: Thank you very much. I wish to compete in gymnastics for another 10 years, and of course, I wish to be at the top.